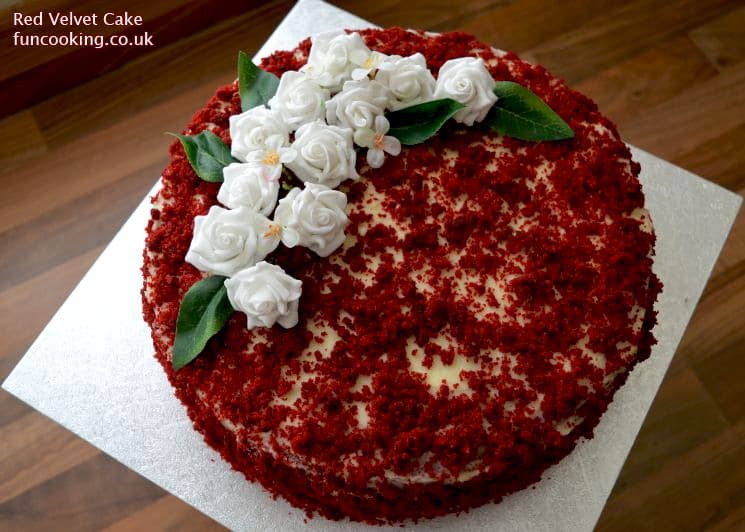 Red velvet cake is traditionally a red, red-brown, mahogany, maroon, crimson or scarlet colored chocolate layer cake, layered with white cream cheese or buttercream. 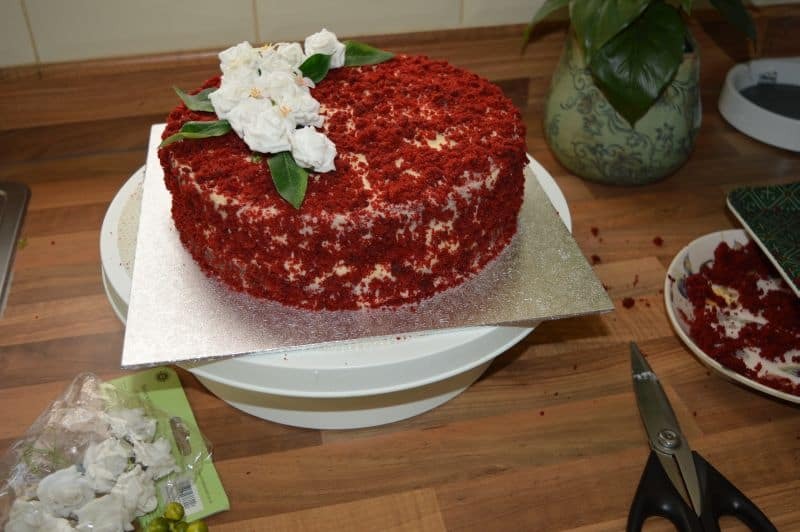 It was my daughter’s friends sleepover party so she asked me to make a red velvet cake with buttercream icing. 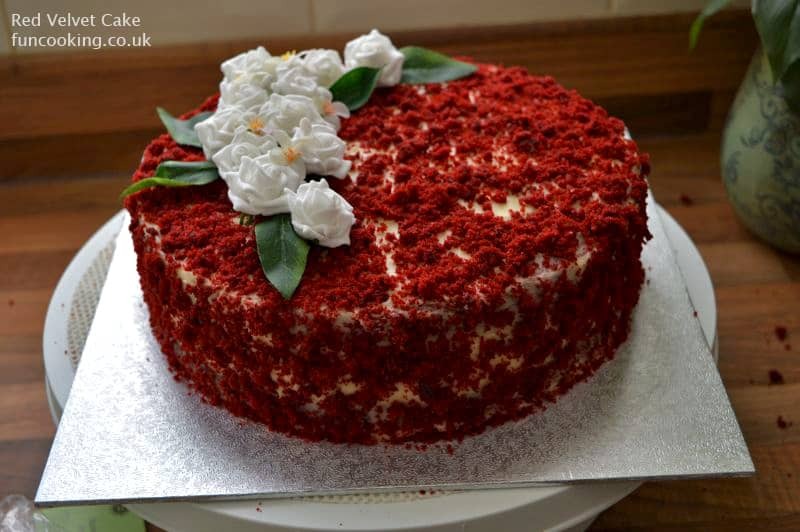 Normally red velvet cake is covered with cream cheese icing but because my daughter doesn’t like that and this cake was for her so I made buttercream to layer the cake. 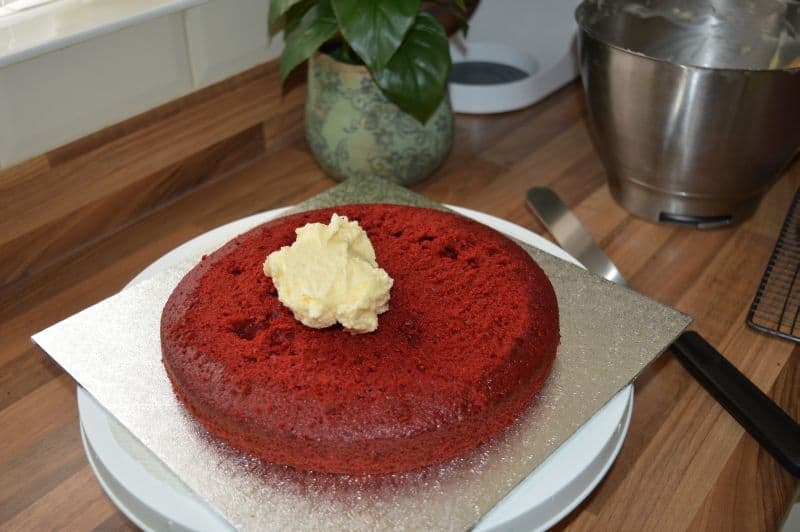 I made a little amount of buttercream because I didn’t want to make this cake heavy and over sweet. 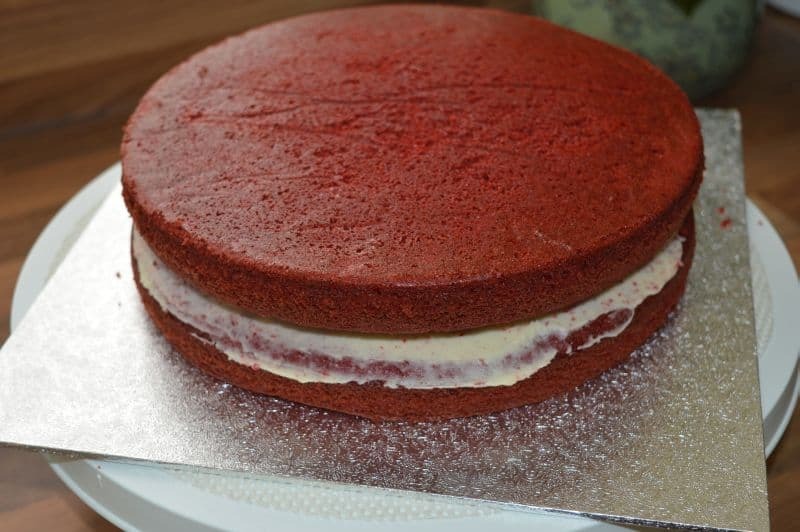 So I layer the cake with very thin layer of buttercream inside and out side. 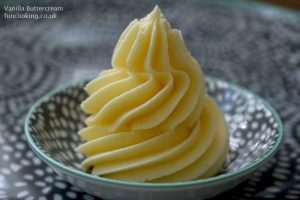 You can double the quantity of buttercream if you are making it for a special occasion and want to decorate it more with buttercream. 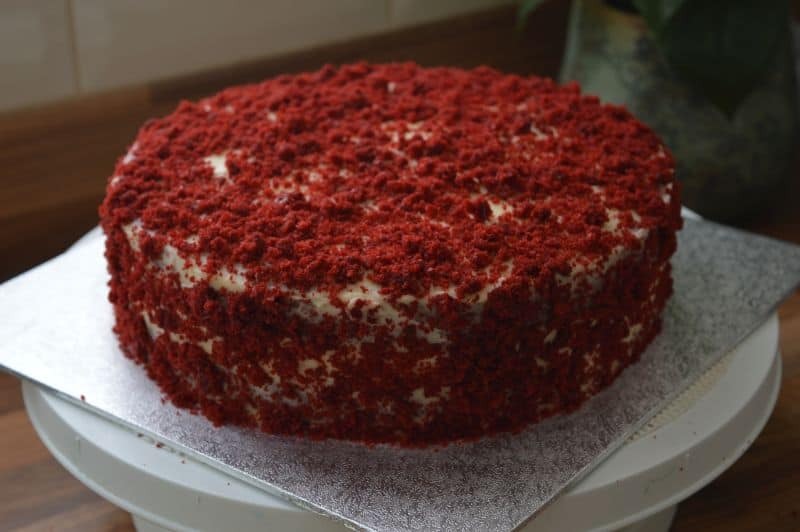 In this cake recipe I used homemade Buttermilk recipe. But you can also use store bought buttermilk. 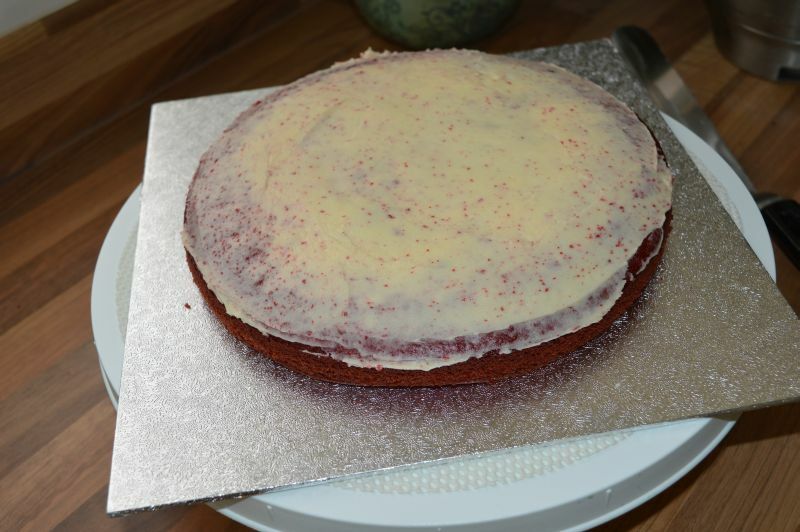 In this recipe I used golden caster sugar but you can use same amount caster sugar. 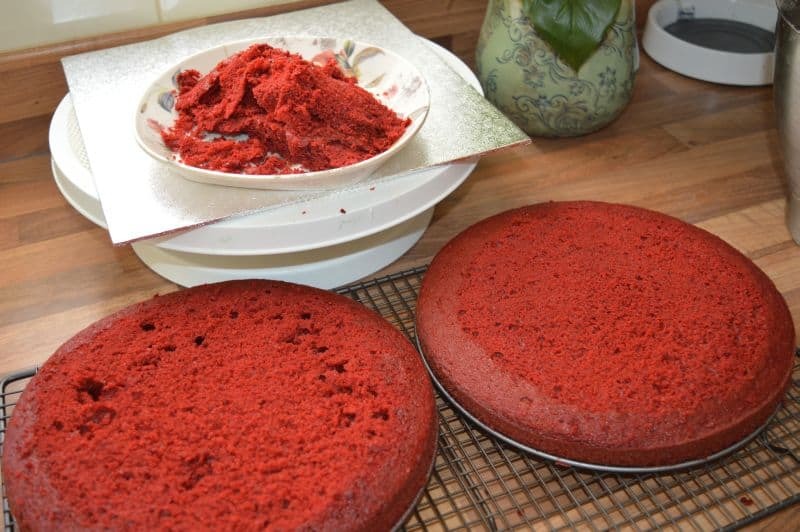 I used Sugarflair Red Extra for this bright red cake. 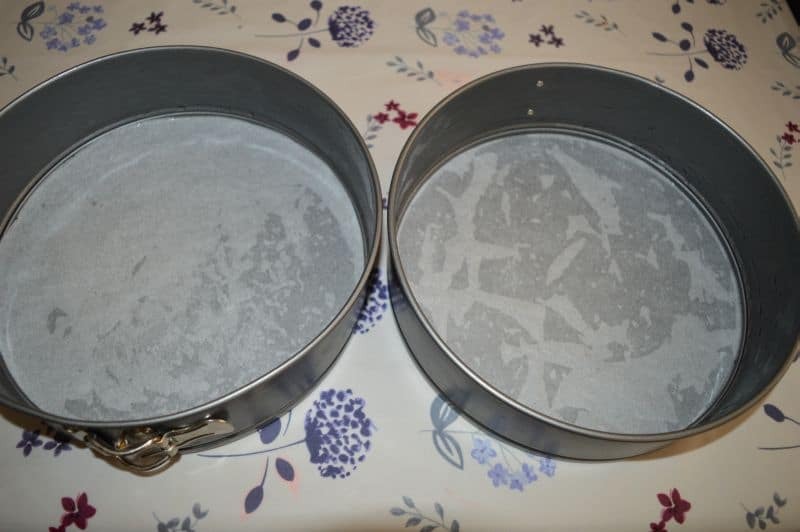 Brush 2 round pans of 9 inch size, with oil or butter then line them with parchment paper. 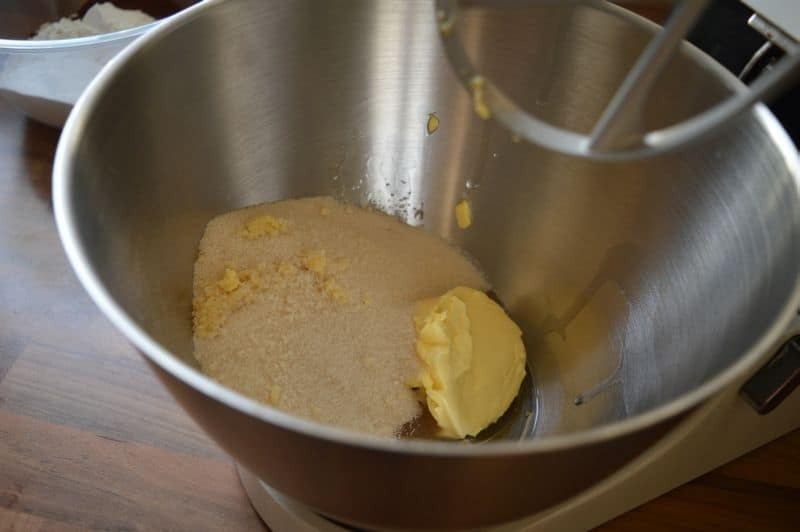 In a bowl of a stand mixer add in room temperature butter, oil and golden caster sugar. 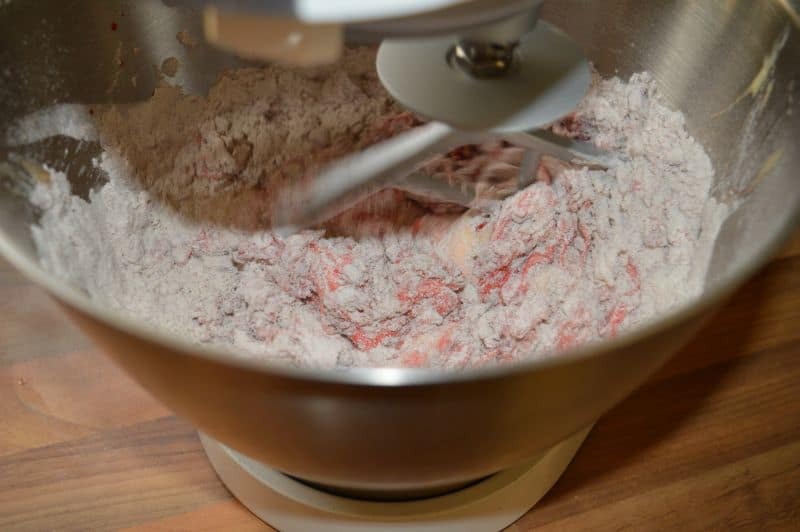 Beat on a medium speed with a paddle attachment until creamy and fluffy. 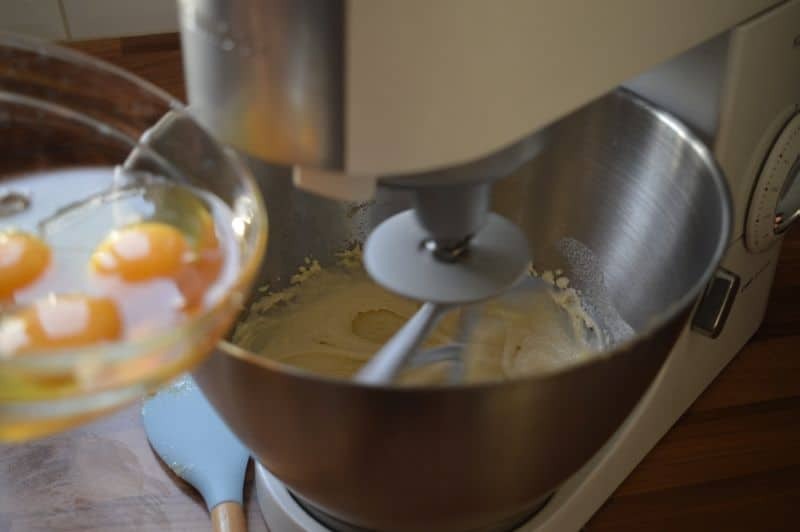 Add in all eggs 1 by 1 and keep beating on low speed until nicely mix. 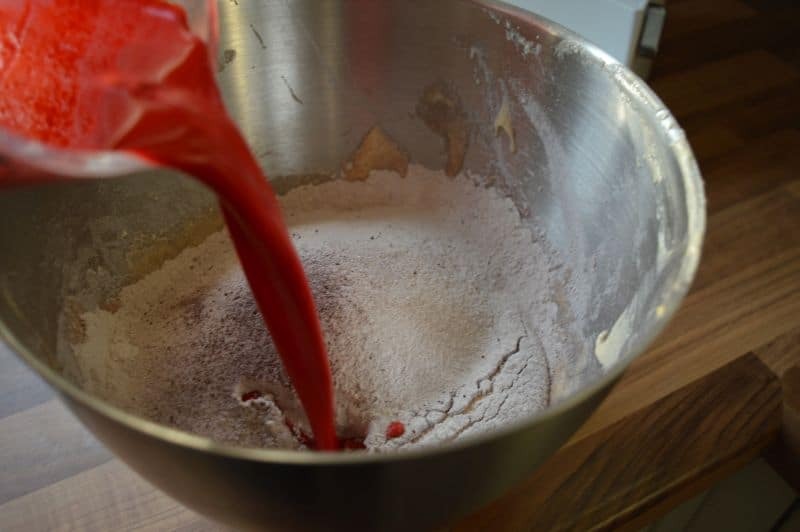 Mix 1 cup buttermilk with 2 tsp white vinegar and 1 tsp red food coloring. 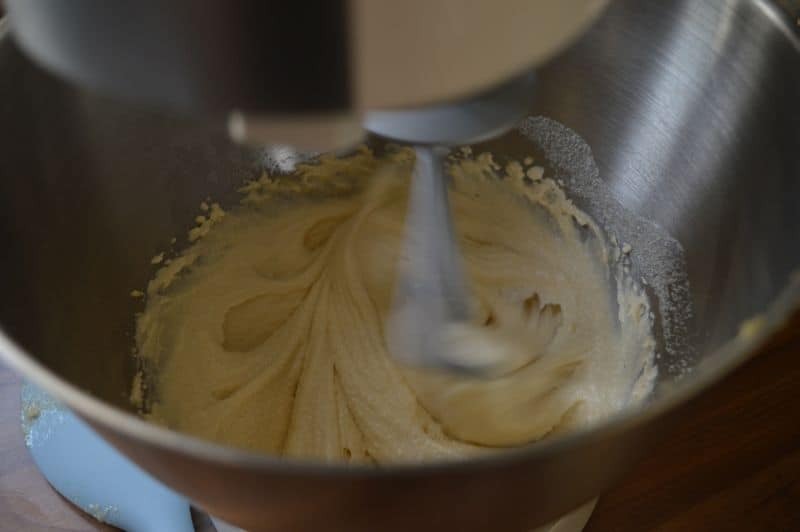 Sift all list ingredients on butter/egg mixture. Add in all buttermilk mixture we made above. 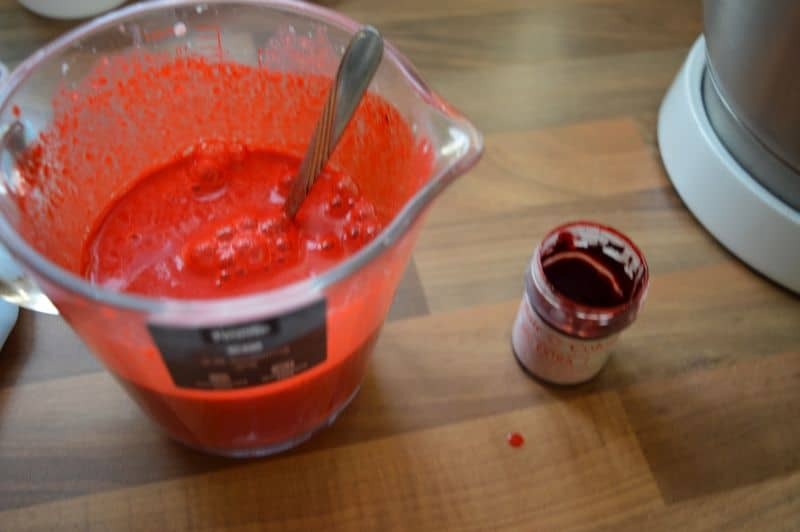 Run the mixture on low to medium speed until nicely mix together. 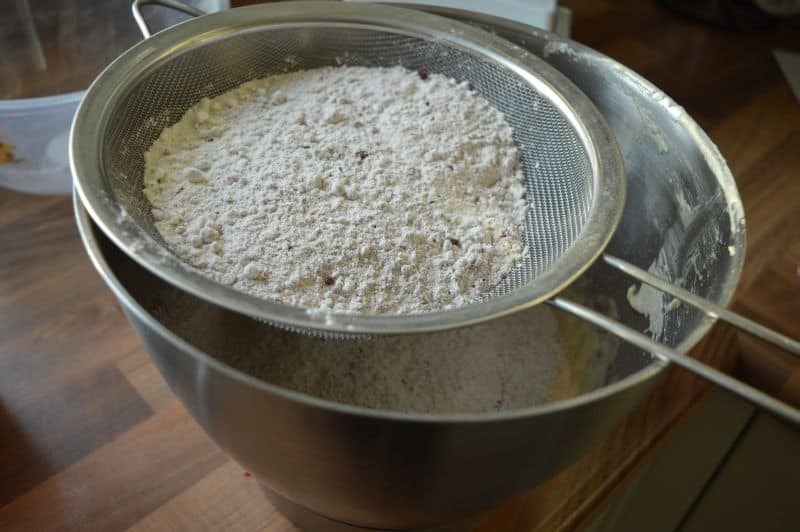 Divide the mixer equally in 2 pans. Bake in a preheated oven at 170 C for 25 minutes almost. Do check it after 20 minutes. 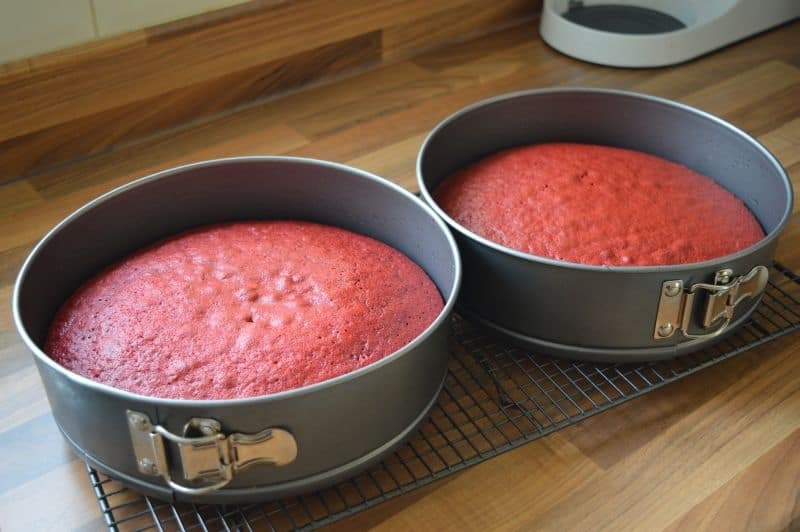 Take out from pans and let them cool nicely. 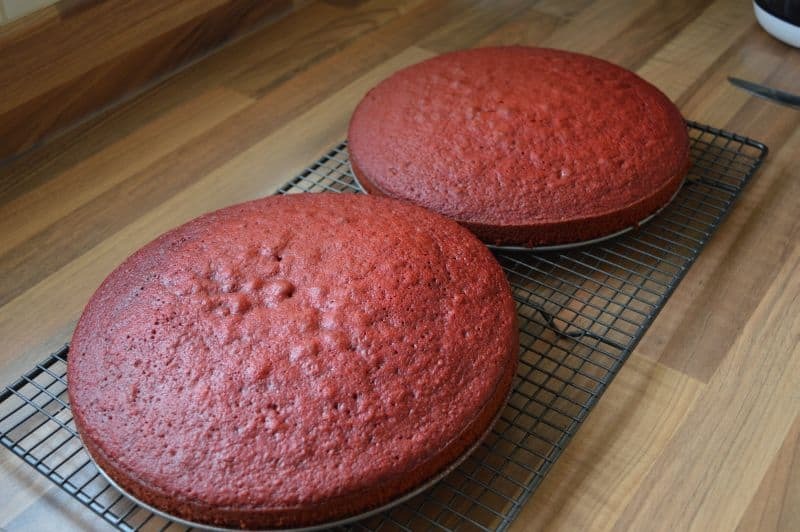 Now for layering, cut the domes of the cakes. 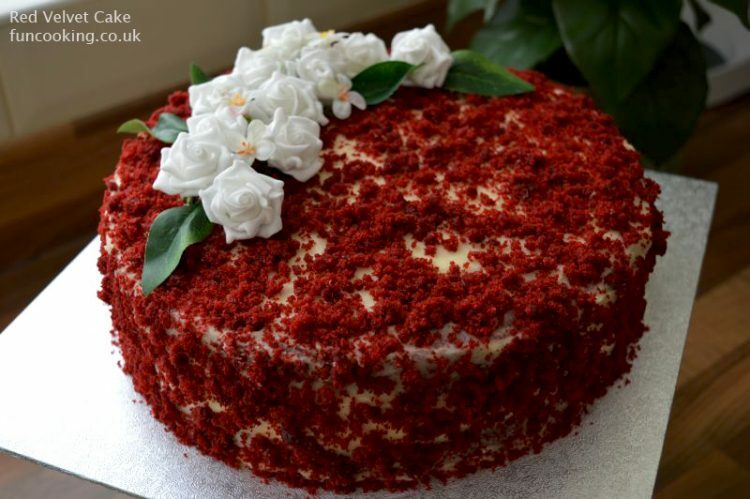 Keep those extra cake pieces for decoration . 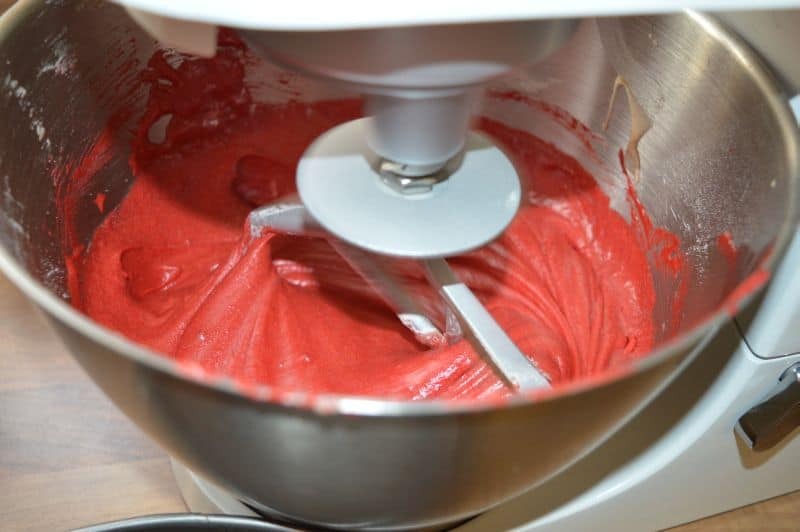 Place almost 1/4 of buttercream on 1 layer. 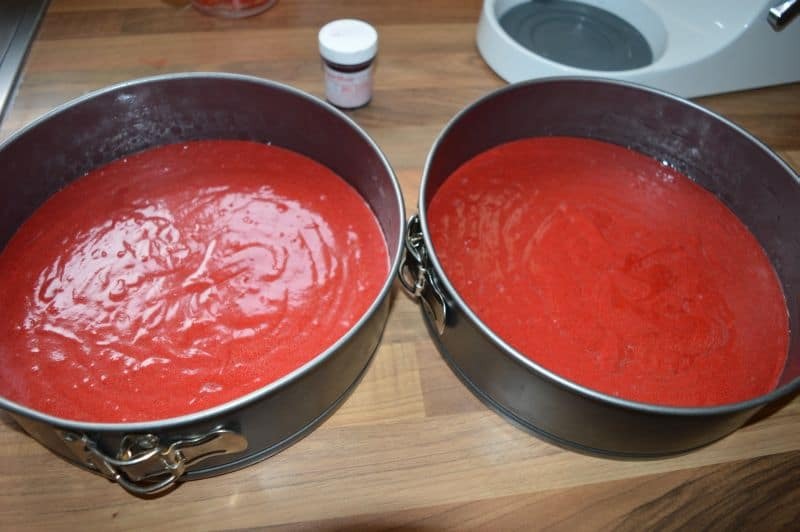 Place the 2nd layer on top. 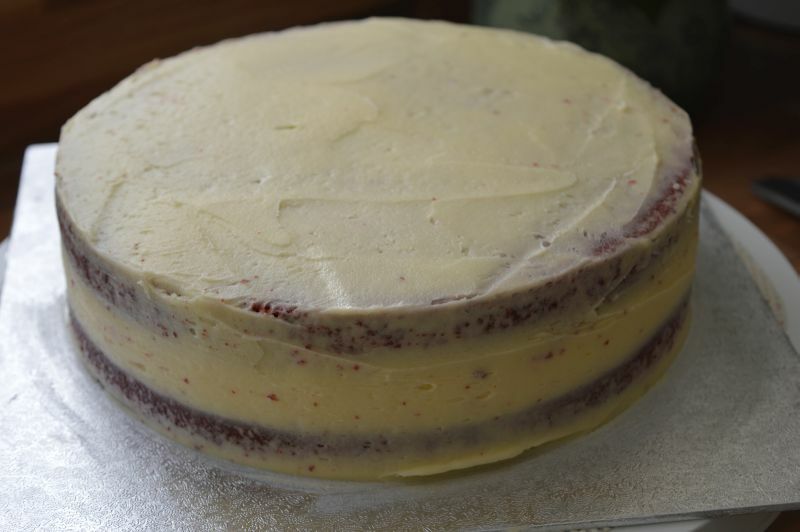 Cover with remaining buttercream. 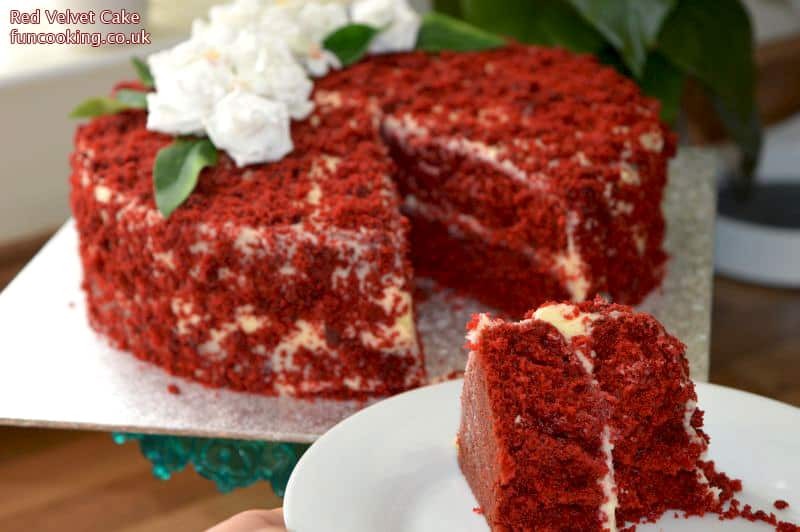 You do not need to do it very cleanly because we are going to cover the whole cake later. 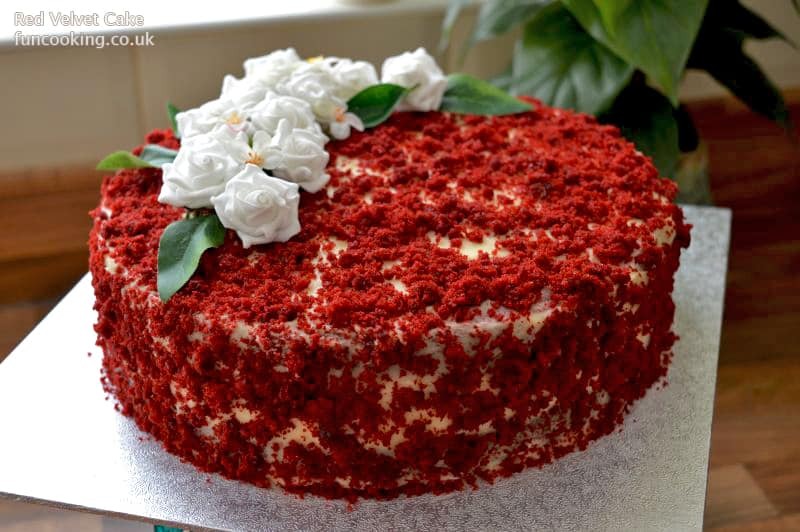 Now with the help of your fingers make crumbs from those remaining cake pieces. 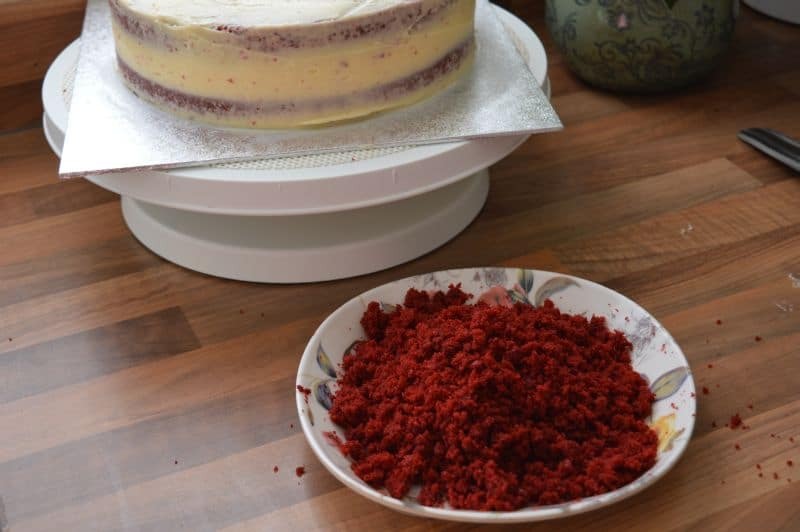 Cover the cake with these crumbs. 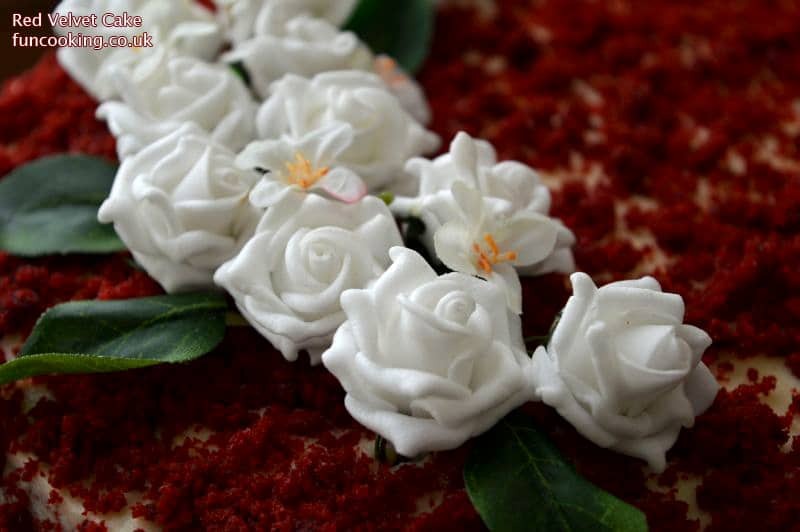 Now I used some artificial small flowers and leaves to decorate the cake. I bought these flowers from hobby craft.